In this training event, speakers from the CloudWave project consortium were presenting not only the main innovations of the project, but were also providing tutorials on some of today's leading cloud computing technologies, such as OpenStack, Docker and New Relic. Finally, to make it more attractive and informative, the event consisted of a mixture of talks and demonstrations. Presentation “Introduction to the CloudWave Project” (Eliot Salant from IBM). Presentation “Managing cloud applications with CloudWave-enhanced OpenStack” (Demo by Dario Bruneo from Universita' di Messina) and Presentation “One size doesn’t fit all - Implementing a Fit-for-Purpose Load-Balancer in Octavia” (Eliot Salant from IBM). Presentation “Hardware Features Enabled Cloud Application Adaptation” (Gregory Katsaros from Intel) and Presentation “FCORE: Coordinated Run-time Adaptation of Cloud Applications and Cloud Infrastructure” (Demo by Amir Molzam Sharifloo from Paluno/University of Duisburg-Essen). 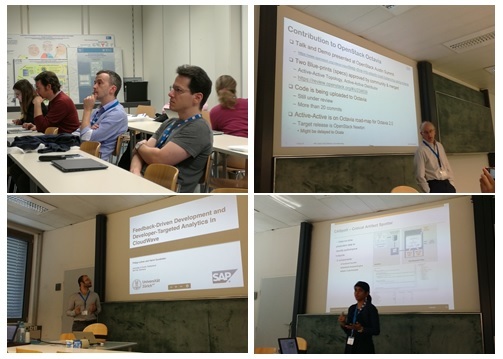 Presentation “Feedback-Driven Development and Developer-Targeted Analytics in CloudWave” (Philipp Leitner from UZH together with Harini Gunabalan from SAP), with Wrap-Up and Closing Remarks (Eliot Salant from IBM). The part of provided trainings which especially attracted an audience interest was a 45 minute session in Elastic Load Balancing for OpenStack Octavia; as an example of application adaptation put on by Dean Lorenz of the IBM Haifa team and presented by the project Coordinator Eliot Salant (IBM). This work was partially developed with CloudWave and dealt with project contribution to OpenStack. We present herein below a short description of the presentations given. The slides, tutorials and demo presentations are available on CloudWave official website under section TRAINING. Description: Owing to the popularity of Continuous Delivery and the increasing adoption of DevOps paradigm, there is a huge amount of cumbersome log information of run-time metrics available in the cloud. Making use of this information to provide useful feedback to the DevOps is known as Feedback Driven Development (FDD). In this presentation, we shortly discuss about the POC developed for the Developers and Operators based on Feedback driven Development. Description: The live demo covers some relevant aspects of managing and monitoring applications in OpenStack. The presentations given included the main issues related to: the effective management of applications in the cloud infrastructure, an overview of the main OpenStack services from the infrastructure provider and application owner points of view and CloudWave project results with particular regards to monitoring infrastructure and visualization tools. The CloudWave-enhanced version of OpenStack was analyzed, showing how it provides a unique way to collect data coming from different sources (e.g., infrastructure, application) and how it is able to improve the management of the cloud environment. Description: The presentation during the ESOCC training event presented the FCORE approach for coordinated adaptation. FCORE uses concepts from dynamic software product lines, in particular feature models, to coordinate the adaptations among cloud applications and the cloud infrastructure. By aligning self-adaptations of cloud applications (SaaS) and cloud infrastructure (IaaS), FCORE facilitates (1) avoiding conflicting adaptations, and (2) exploiting synergies among adaptations. Thereby, FCORE contributes to improving the operation of adaptive cloud systems. We show how FCORE is used to represent adaptive elements in application and infrastructure and link them to high-level system requirements. Furthermore, we present how to check the consistency of an adaptation plan and how to rank multiple plans based on the level of requirements' satisfaction. After an introduction to the problems that are addressed with the FCORE approach and explanation of underlying ideas and technologies of the FCORE approach using slides, a live demo of the FCORE editor, an Eclipse implementation, was given. The FCORE Editor allows creating FCORE feature models to guide coordinated adaptation. Description: It presents an overview of the problems in dynamically assigning resources to applications running in the cloud, and introduces CloudWave's approach to handling this problem. Description: It describes the work on Elastic Load Balancing as a Service that IBM developed for the OpenStack Octavia component, including a time line of actions with the OpenStack community to get this accepted into an official release. Description: Harini Gunabalan (SAP) and Philipp Leitner (UZH) were presenting the CloudWave work on Feedback-Driven Development (FDD). After a short introduction of the motivation and theoretical background behind FDD by Philipp, Harini showcased the SAP implementations of the idea using a demo video. Description: Adaptation Engine Framework holds plugins for sub-adaptation engines. It consolidates voting of all sub-adaptation engines into a final recommendation list. The main objectives of this conference were to facilitate the exchange between researchers and practitioners in the areas of Service-oriented Computing and Cloud Computing and to foster future collaborations in Europe and beyond. For the CloudWave team it was a unique opportunity to present its final results and achievements. In overall, two keynotes were given during the 3-day event, 16 research papers were presented as part of the main track, and five workshops took place. The ESOCC event attracted more than 90 participants in three days. More information about CloudWave - Agile Service Engineering for the Future Internet - Training Session, Organising Committee and agenda can be found on www.esocc2016.eu/cloudwave-training-session/. The final Booklet is now available on www.esocc2016.eu/booklet/ with the ESOCC 2016 proceedings on www.springer.com/de/book/9783319444819. The photos from the event are available on www.heart.goemb.at/album/2016.09.05-esocc-2016-day-1/, www.heart.goemb.at/album/2016.09.06-esocc-2016-rathaus/ (the courtesy of the ESOCC organizers).